Turning a cover image into a book cover file for print publication is a process that often trips up new authors or publishers. However, this does not need to be the case. This book takes advantage of the author’s years of experience of preparing clients’ book cover files for Lightning Source and CreateSpace. In this book, she has distilled her techniques down into eight simple steps that anyone can understand and implement. Numerous screenshots make learning the steps even easier. Learn how to use Photoshop and Adobe Acrobat Professional to create professional book cover files for Lightning Source and CreateSpace. Book cover files can also be made with free imaging software, such as Gimp. However, cover files for Lightning Source require a few extra modifications, which only Photoshop or Scribus can produce. Are you ready to take that final step to publish your print book? 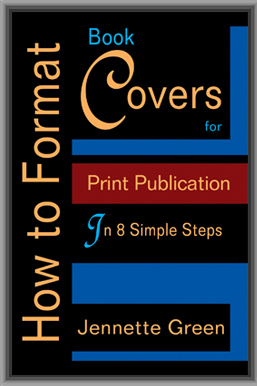 It’s time to turn your cover image into a book cover file in eight simple steps! All three books in this series are combined into one comprehensive volume entitled, Book Formatting for Self-Publishers, A Comprehensive How-To Guide. It is available in both Kindle and paperback editions. Have you written a fiction novel or a nonfiction book that you would like to publish? Would you like your book to be distributed to the major online book retailers, such as Amazon and Barnes & Noble? With an excellent book and an eye-catching cover, you can do it, and it is more simple than you could imagine. I have spent the last several years formatting and preparing clients’ book interior and cover files for Lightning Source and CreateSpace, as well as ebook files for Kindle, NOOK, and Smashwords. All of my clients have been very pleased by the look of their books, and every file was accepted by the online distributors. This book will give you simple, step-by-step instructions on how you can use Photoshop and Adobe Acrobat Professional to create cover ready files for Lightning Source and CreateSpace. You will learn that covers can also be made with free imaging software, such as Gimp. However, covers for Lightning Source require a few extra modifications, which only Photoshop or Scribus can produce. More information on Lightning Source covers is given in the next chapter. 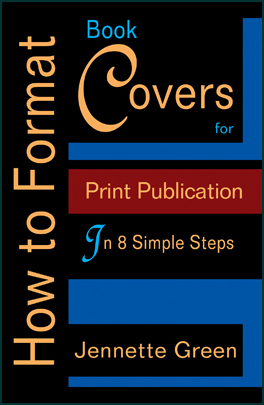 Are you ready to prepare your book cover for print publication? Let’s begin! I use Adobe Photoshop CS5 and Adobe Acrobat Pro 9. The commands in earlier or later versions should be similar. As noted in the Introduction, other imaging software programs can be used to create your cover; however, if your file will be uploaded to Lightning Source (LSI), then Adobe Photoshop or Scribus will be needed in order to finish it. More on this shortly. Although this book will cover the requirements necessary to make cover files compliant with the standards of both LSI and CreateSpace (CS), I will primarily address LSI’s requirements, as they are more stringent. If your cover meets LSI’s standards, it will meet CS’s standards, as well. In this book, the terms CMYK color and RGB color will be used. Please note that these are two different color spaces. Although I will not go into all of the fine points of the two color profiles, suffice it to say that CMYK colors are used for print publications, and RGB colors are used for the internet, color monitors, and ebooks. Since this book is about printing covers for physical books, we will discuss ways to achieve the best CMYK color for your cover files. Most image programs, especially the free versions, such as Gimp, use RGB color. Your image program may or may not be able to convert RGB colors into the CMYK colors required for printing. It is certainly possible to build your cover in one of these free programs, as mentioned earlier. If you are making a cover for CreateSpace, that program may be all you need. Please see the next section, which is entitled, “A Note About CreateSpace Covers,” for more information. However, although you can certainly build your cover in a low-priced image program, if you will be submitting your cover to LSI, you need to be aware that they enforce a 240% ink limits requirement on all cover files. That means that your darkest colors can be a maximum of 240% ink saturation. This is a problem, as black is typically 300%, and other dark colors present similar issues. As a result, while you definitely can build your cover in a free or low-priced image program, you will eventually need to convert your file to LSI’s 240% ink percentage requirements. As of the publication of this book, the only programs I know that will do this conversion are Adobe Photoshop, and Scribus. So, you will need to use Scribus, or a friend’s Adobe Photoshop program to apply the 240% ink limits to your file, or else you will need to hire someone (such as myself, or another freelancer) to do the work for you. Diamond Press currently charges $35 to convert a cover file. You may find a different, competitive price from a freelancer online. If you would like to create a cover file for CreateSpace, as mentioned before, it is certainly possible to do so with GIMP (a free, open source image program available online), or another image software program of your choice. Although your image program may not provide the ability to convert your images to CMYK color, a work-around to create a CMYK cover PDF for CreateSpace is possible. 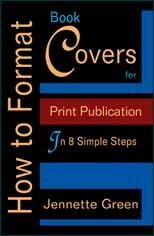 First, read Steps One through Five in this book in order to familiarize yourself with the template and the techniques necessary to create a cover that will pass CreateSpace standards. Of particular importance is to ensure that your image is the correct dpi, and placed properly on the CreateSpace template. After you have made sure that your cover is the correct dpi and placed on the appropriate template, save it as a flattened (all layers flattened into one layer) TIFF file. Open the file in Adobe Acrobat. Next, go to the section entitled, “Save Cover as a PostScript File,” which is located later in this book, within the “Create Your Cover PDF” chapter. When you make a PostScript file, and then afterward process the file using the PDF/X-1a:2001 settings in Acrobat Distiller, the RGB colors will change into CMYK colors. Make no mistake, however, this method will not work for LSI, because black will be converted to 300% ink saturation, which is prohibited by LSI. As mentioned before, LSI’s maximum ink limit is 240%. CreateSpace does not have this requirement. Please read on to learn more about preparing your cover for CreateSpace. Let’s begin work on your file. Since you will be making changes to your cover image in the following sections, it is best to preserve your original file. Open the original file, and “save as” a new file name—I like to add “CMYK” (without quotes) to the file name, so I can distinguish it from the original (for example, MyCoverCMYK). Now you have a new file to work from, and the original will remain untouched.